Puppy Brady & Boomer are happy, friendly, social puppies who will be big boys full grown! Moderate to Active, big-dog lovers with the time to devote to companionship, exercise and training a must! Available for adoption INDIVIDUALLY. 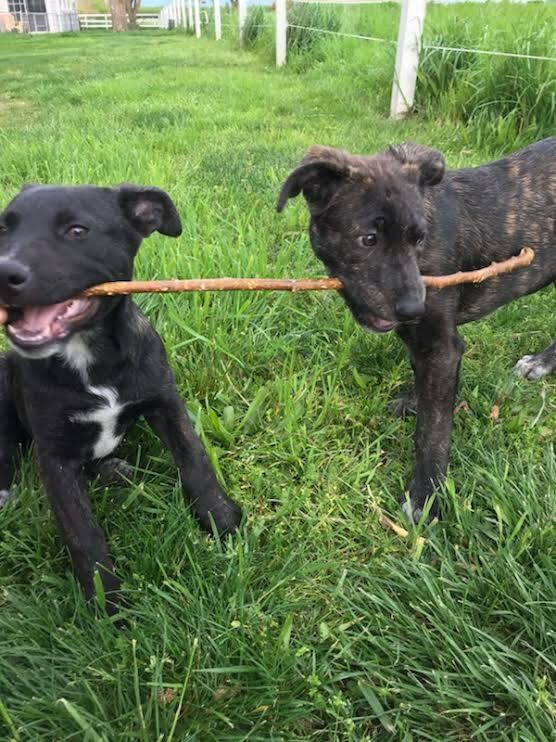 These pups were owner surrendered to HFP -- Mom was a German Shepherd and Dad was the neighbor mutt-- just another accidental and unwanted litter out of Central California like so many of the dogs who come to us are. Both boys are very easy going and smart. Brady is a little more independent and Boomer loves to snuggle in the crook of your neck. Both boys have no trouble sleeping through the night! $300 adoption donation -- vetted, vaccinated, dewormed, flea treated, microchipped. Adopters are responsible for finishing age-appropriate shots & providing proof of spay/neuter between 5-6 months of age.